I love to eat protein-filled salads for lunch. They are nice and filling and don't spike my blood sugar so I can work without being distracted by snack cravings all afternoon. Tempeh is one of my favorite proteins. It's really quick and easy to prepare and very versatile because you can spice it up all kinds of different ways. Your meals come together even faster if you prep the tempeh in advance. In this salad I went with a nice smoky marinade that combines really well with the creamy avocado and the tangy balsamic vinaigrette. If you like your lunch a bit more filling, you can bulk this salad up with some almonds, hemp seeds or pumpkin seeds. Slice the tempeh into strips or cubes (triangles or diamonds are also cute!). Mix the soy sauce, vinegar and liquid smoke in a bowl. Put in the tempeh and toss it around for a bit to evenly cover all the pieces in marinade. Let the tempeh sit while you preheat a non-stick skillet to medium high heat. Sauté the tempeh in the oil until it is nicely browned on all sides. Take care it that doesn't burn. 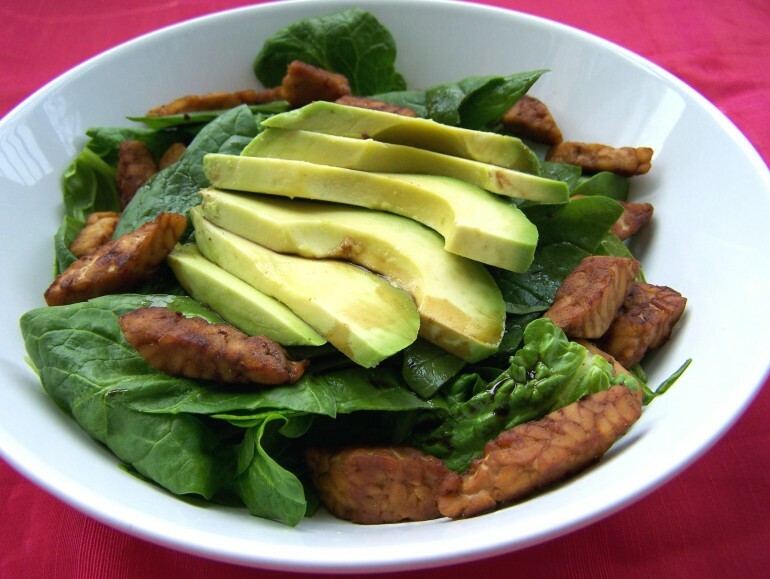 Divide the lettuce or spinach over two bowls and mix in the balsamic vinegar, olive oil and sweetener. Place the sliced avocado, tempeh and almonds (if using) on top, or jumble everything together if you don't care what it looks like and serve! Half of this recipe (a one person serving, including the almonds) contains about 530 kcal, 40.8 g fat (6.5 g saturated), 12.7 g net carbs, 9.2 g fiber and 29.6 g protein. This was delicious! I did modify it a bit: I used coconut oil for frying the tempeh, instead of vegetable oil. Also, I used paprika and garlic seasoning instead of liquid smoke in the marinade. I added half a green bell pepper to the salad and topped this off with a hard boiled egg (I'm not vegan). For the dressing I used: olive oil, fresh lemon juice, flaxseed oil and dijon mustard mixed together. So, yeah, a few modifications according to what I had on hand and how I eat but yours was the inspiration! I am adding this to my go-to recipes. And my boyfriend declared it a winner :-) Thanks! This was delicious and easy to make! Thank you! !